When informed I was to be a recipient of this incredible scholarship I knew immediately that I would have some pretty heavy emotional experiences in France and Belgium. I knew that we were going to be going to some particularly large cemeteries and that I would see rows upon rows of graves. I had the time and means to prepare myself for Menin Gate and Tyne-Cot, which we visited later on in the day, but I had no way to prepare myself at all for our first war cemetery: Langemark. We pulled up our two Europcar rental vans into the driveway and there were a few busloads of British schoolchildren arriving about the same time. They all had their little duotangs or pamphlets and it reminded me of school trips to, say, the National Art Gallery. The atmosphere of the children going in was one of a typical school trip. I thought this might be a good stepping stone for me. Germans are the bad guys, right? I can handle to see a bunch of dead bad guy graves, right? We stepped out of the vans and had our little introduction. Among the tidbits of interesting facts we received: the graves were black, not the white of the Commonwealth cemeteries. Black’s an evil colour, the dark stones are obviously seals to whatever hell evil German soldiers go to after the Commonwealth finished with them. I mean, even the graves were colour-coded. Who says war isn’t black and white? The first thing you would notice about the graveyard is the perimeter of oddly shaped trees. I suggested they might be native to Germany; sort of how a Canadian monument or grave site might have maple trees and other good Canadian stuff. Someone suggested it was the way the trees were trimmed. They looked like an umbrella that’s been mangled inside-out by the wind. A long trunk and a bunch of branches shooting upwards from it. Past the gate were large trees and it was much more shaded and enclosed than any Commonwealth cemetery we’ve seen so far. Architecturally speaking, it had a moat, a wall, and a gate. Clumps of crosses in threes (which look curiously like soldiers if you’re in a weird headspace) are scattered about the graveyard sparsely. These are not the graves. Inside the gate there are two rooms. They are about 15 by 15 feet and poorly lit. The room on the right was the first I entered and it was probably the most powerful experience of my day. The room looks like it is built of bricks, but once you enter you realise those bricks are simply blocks of eight engraved names. 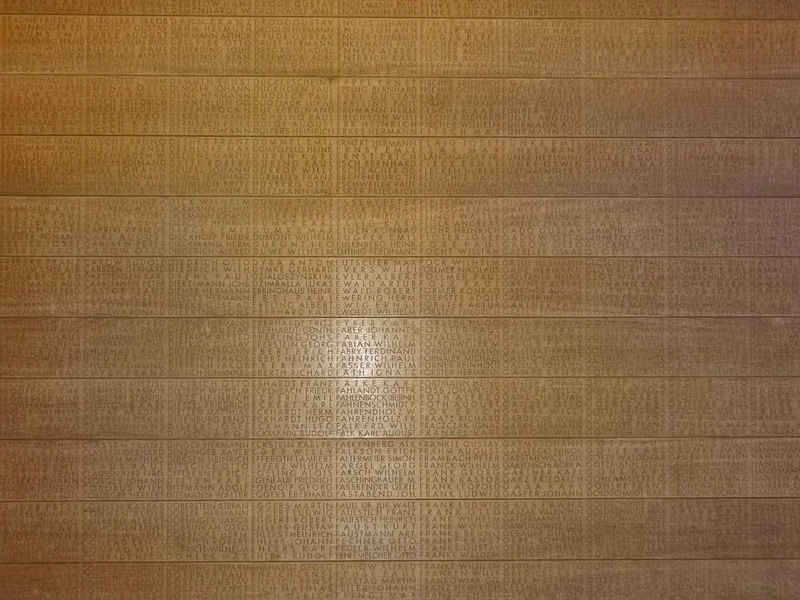 In total 4309 names run across the wall of this room. As a university student it was horrifying to learn that these names were German university students who volunteered for the war and all died. I found myself empathising with these men more than with the men I imagined I might associate with (young lieutenants, Newfoundlanders, Scottish soldiers). 4309 student-soldiers killed in action here in France were the first deceased I visited. Moving past this initial gate you see the mass grave, with a little memorial that’s covered with wreathes (notably the German wreathes are more down-to-earth, less covered with poppies and more a simple Christmas-style wreath with a simple flower attached). Around this mass grave of students were black stones filled with names upon names of war dead. Beyond this was what one might recognise as a graveyard. A number of simple stone plaques on the ground listing names (privates with officers with jagers) or perhaps simply “X unidentified soldiers.” The French graves say “died for France”, the Commonwealth graves boasted crosses, insignia, unique epitaphs. The German graves had only names. Our attention was drawn to the difference between the Commonwealth cemeteries and memorials and the German cemetery of Langemark. The Commonwealth graves are individual, two-feet white tablets with an epitaph, a cross, an emblem, etc. The German graves usually list multiple soldiers, are simple stone on the ground, with only ranks, names, and service numbers. In the Commonwealth cemeteries it is important to equally commemorate all soldiers. Privates get the same treatment as officers. I felt like this was even more evident in this German cemetery. There were just names upon names clustered together on stone tablets. All dead soldiers beneath us. The fact that the first war cemetery we visited was a German cemetery was speculated upon a lot by myself and some other students. Was it on purpose? When we asked one of the guides he said that it was just geographically the first thing that made sense. I think this had a really interesting effect, though. If we had gone to a few Commonwealth cemeteries first and then visited Langemark I might have reacted totally different. I imagine I would have thought something that Germans killed all the Commonwealth soldiers and so this HUGE grave was some sort of sick justice. That is not how I felt at all. This huge grave was a tragedy, a sacrifice, a sad story that I did not enjoy experiencing at all but am glad came first on our tour. I expected this to be a tour focused entirely on Canada and its contribution to the wars. To be hit with German death first was a bit of a doozy.